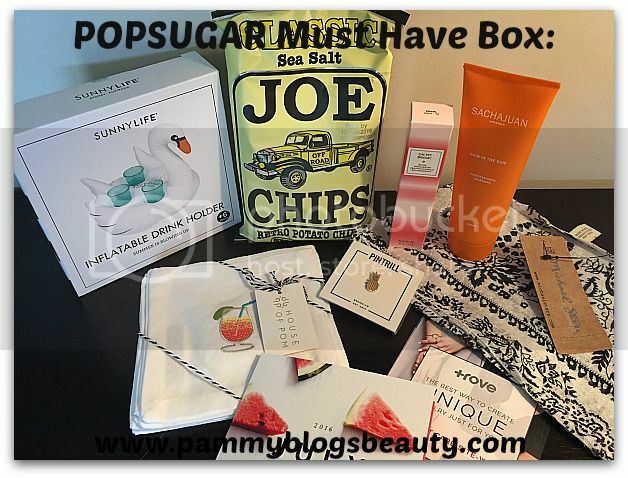 Pammy Blogs Beauty: POPSUGAR Must Have Box: July Box Opening! POPSUGAR Must Have Box: July Box Opening! POPSUGAR July 2016 "Must Have Box": Box Opening! How about a box-opening post today ladies?! I am super excited to share about this July "Must Have Box" from POPSUGAR. Subscription boxes are just too much fun! I love the element of surprise and the gifty feel of the POPSUGAR boxes. The POPSUGAR Must Have Box gets delivered right to your door and is beautifully packaged! I literally have to dig inside these cute boxes right away to find out what goodies are inside. Want to hear about what was inside my July 2016 Must Have Box from POPSUGAR? Please click "read more" below to find out! PINTRILL | Pineapple Pin: What better way to pin your skinny scarf into place than with a cute pin? Our editors are obcessed with pins and pineapples lately, and this adorable bauble is the perfect way to steal the trend for yourself. What a cute little pin! I am going to love wearing this. Retails for $30.00. EUROPEAN WAX CENTER | Oh my Brow! Brow Highlighter in Pearl: This highlighting illuminator is a jack-of-all trades for your beauty bag-you can instantly lift your brows by blending it along your brow bone, widen eyes by applying it on your inner corners, and add glow to your cheekbones, or add a romantic touch to your lips by dapping it above your cupid's bow. I love a good highlighter. So, I am excited to try this. Retails for $19.00. TROVE | Gift Card: Treat yourself to Trove's on-trend, customizable jewelry with a special gift of $20-there is something for everyone in this chic collection! This is a code for $20 off. Looking forward to checking out the site. I am super excited to share a special coupon code! Include the code SHOP5 (which never expires) to get $5 off your FIRST Must Have Box!